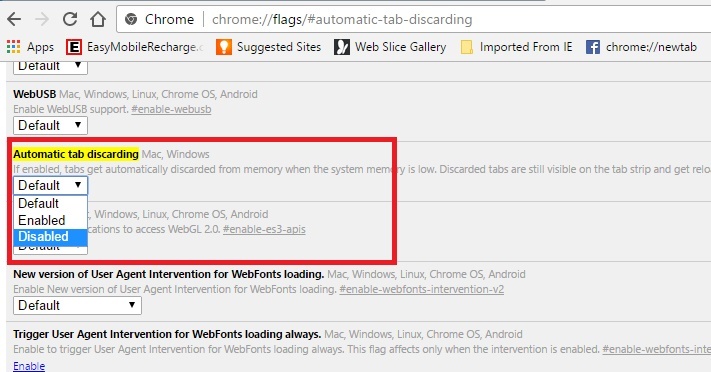 Home > Software Tutorials > How To Disable Auto Tab Refresh In Google Chrome? Google Chrome version 48 comes with a new feature that automatically refreshes your webpages that are opened on your browser for a long time. If you have opened a set of webpages and then left the computer for a certain period of time, the Chrome web browser will analyse and detect how much time has elapsed and if any change in the webpages has taken place within the course of time. If yes, then Google Chrome will refresh the webpage and load the latest versions of the page. This means you will not need to refresh the webpages after a certain time interval. This feature of auto-refreshing has a name. It’s called the Discarded Tabs. Discarded Tabs feature aims to provide users the latest version of the webpage with updated content. It also aims to reduce memory consumption. This feature is beneficial and is recommended that you keep the feature turned on. If for some reason you want to get rid of this feature, you can disable Discarded Tabs option. There can be several reasons for which a user may want to disable auto-refresh or auto-reload of webpages. The following tutorial will help you disable auto tab refresh feature in Google Chrome. 3. Next, open the dropdown under it. Select ‘Disable’ and relaunch Chrome. 4. It’s done. Now, Chrome will not discard tabs. When you visit a tab after a long time, it will not automatically refresh. Here you will find the complete list of all tabs that you have opened in Google Chrome. Each tab, with its title has a ‘Discard’ link. Choose the one you need.